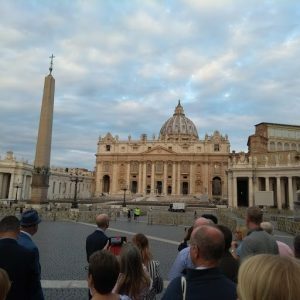 I get the chance through my work to meet a lot of great people, in some interesting places (from prisons to palaces), and the Caritas Leadership Week near Rome did not disappoint. 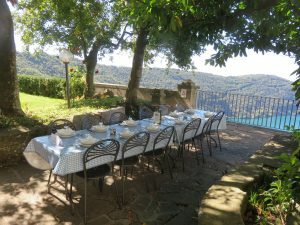 We were a group of fifty, representing a range of Catholic charities and dioceses in England and Wales, staying at Villa Palazzola, a 13th century Cistercian monastery perched above a volcanic lake, Lago di Albano, and according to the website ‘Rome’s best kept secret’. From the garden terrace at the Villa (where pre-dinner drinks were served in the evening!) the view is vast and truly breathtaking. 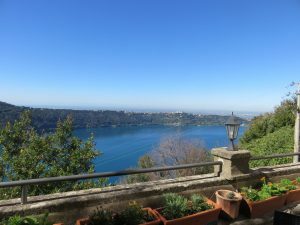 On the opposite side of the lake can be seen the twin towers of Castel Gandolfo, the summer papal residence; beyond that in the distance the urban sprawl of Rome; and further still on a clear day the bright blue of the Mediterranean. I loved to stand on that terrace at various times of the day and to behold the subtly changing vista and colours. The sunsets over the lake were especially stunning. Another central element of the week was prayer and liturgy. Amongst the group were four of the loveliest and most down to earth priests (also a deacon) and they led us in a daily celebration of mass, and in the morning (7.15 am!) and evening prayer of the Church. 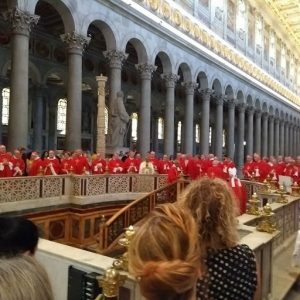 One morning the mass was in the crypt of St Peters, in front of the tomb of St Peter; and the following day it was with the bishops of England and Wales in the magnificent basilica of St Paul’s Outside the Walls, and which included a final prayer at the tomb of St Paul. And there was music! I found a guitar in the house and one evening after the bar had opened I got together with Sean who had a collection of tin whistles and recorders, having worked as a professional musician before joining Caritas. What a session that was! We spent about two hours singing mainly Irish songs, some of which I hadn’t sung in over twenty years but somehow could still remember the words to. Being a mainly Catholic group, a lot of people had Irish roots and there was no shortage of either requests for yet another Irish song or people joining in. Then on the final night Sean compered a musical evening during which several people did turns. One of my favourite pieces was a music hall song called ‘Light fingered Freddy’ which is from a Salvation Army musical (I never knew such a thing existed). Yes, one of the CSAN directors is a salvationist, and what a great guy he is. He runs as well! 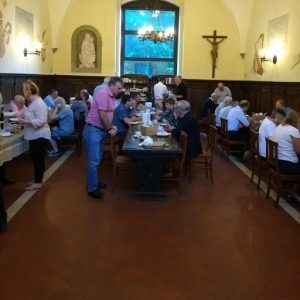 We were not just eating, drinking, singing, swimming and praying: there was excellent input, besides two trips into Rome to meet different groups (and to have lunch with the British Ambassador to the Vatican). The main speaker was Kerry Robinson, who founded ‘Leadership Roundtable’ based in Washington DC. She was particularly eloquent on the urgent need for the Catholic Church to harness the gifts of women in leadership at all levels. 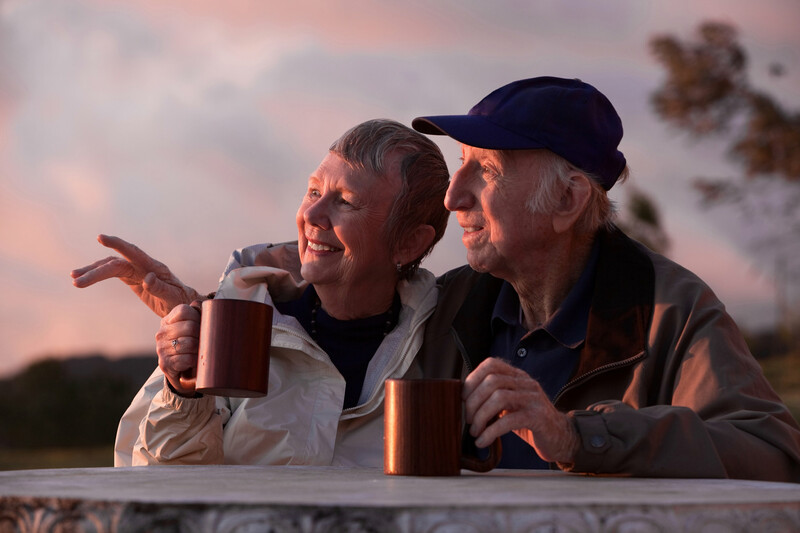 I was excited when Kerry mentioned Henri Nouwen, the Dutch priest who had been a member of L’Arche in Toronto and of how he had encouraged us to be people of joy and gratitude. This was in the context of fundraising which was one of the themes of the week and I later shared with the group something Henri has once said in a talk about fundraising: “when we ask people for money we shouldn’t be embarrassed or apologetic; we should say ‘it is my pleasure to invite you to share in our mission’”! 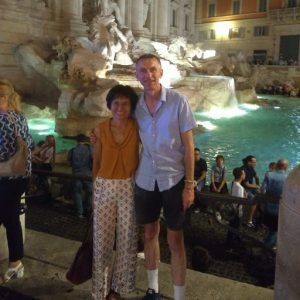 Another inspiring speaker was Sally Read, an English poet living near Rome, who told one evening the very moving story of her journey from atheism to faith. And I was touched as well by our meeting with members of Sant’Egidio, a community in Rome that reaches out to those in need, including many homeless. 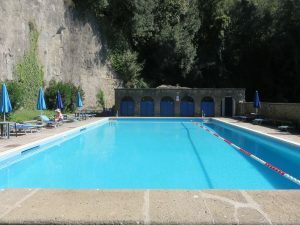 And to all the wonderful people I met at Villa Palazzola: keep up the great work and hope to see you again. Glad to hear you had a good and rewarding time in Rome. Evokes memories of last trip to Rome for the occasion of friend becoming a Deacon at ceremony in Basicilia Of St Paul. Great to contribute and hear other views and opinions. 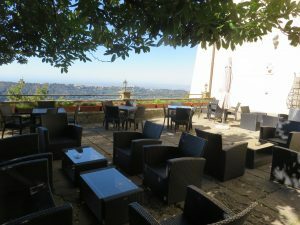 Also good to take in the beauty as we did in taking in the views from Castel Gandolfo. 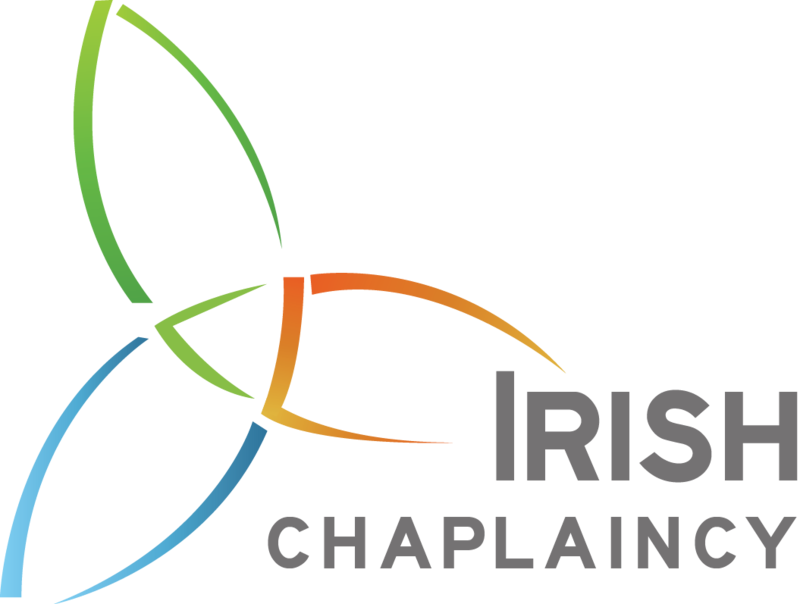 As you say great networking opportunity as I also found at Adoremus event in Liverpool when chatting about Across.Enjoy Ireland and catching up with family – still holding recent memories of visit of the Pope and a lovely family day out from Belfast to Dublin for the Papal Mass. I was a teenager when I climbed Croagh Patrick (no climbing boots !) and can remember it as if last week. 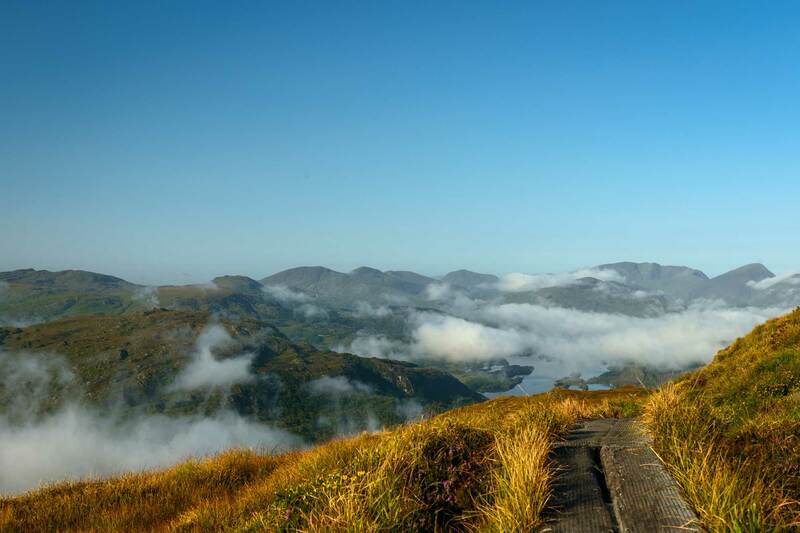 Enjoy both the walk and the climb.